The article 4 Improvements in Future-Fit Business Benchmark: Public Draft 2 written by Bob Willard, a long serving board member of The Natural Step Canada, was originally published on sustainabilityadvantage.com. The Future-Fit Business Benchmark is a project that is co-led by The Natural Step Canada and 3D Investment Foundation. As many of you know, Geoff Kendall, CEO of the Future-Fit Foundation, and I are co-authoring the Future-Fit Business Benchmark. We received valuable input from dozens of experts on our first public draft, published in October 2014. 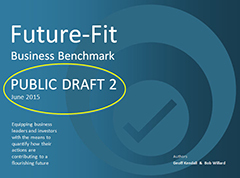 Based on that feedback, we have refined our document and have just posted Public Draft 2 on the Future-Fit Business website. Following this second and final round of feedback and suggestions, we will publish Release 1 later this fall. Below are 4 improvements in Public Draft 2. It is tighter, with 21 goals instead of the previous 28. The linkages from science-based System Conditions to Business Principles to Future-Fit Goals are clearer. The “future-fit” label is better supported. We connect how a company that performs well on the goals mitigates 16 future global risks and positions itself to reap 16 business benefits. This draft makes it more evident that being future-fit is not a sacrifice; it helps fulfill a company’s fundamental fiduciary duty to capture opportunities and mitigate risks. This draft includes considerations for defining key performance indicators (KPIs) for each goal and encourages the public and issue-specific experts to help us co-create the KPIs through an open wiki approach. This is an exciting milestone for our project. Academics, industry bodies, and NGOs have spent years wrestling with the issues that we’re covering. We have already drawn on their work to create the 21 goals. To create the associated KPIs, we want to continue to partner with these groups and others to integrate the best of what’s out there into useful metrics by which companies can assess their progress toward the goals. So, we are inviting you to help us get this right. The downloadable Public Draft 2 document provides guidance on how to provide your feedback, suggestions, and comments on the overall document, the goals, and especially the KPIs. If you have any questions about any of this, let me know. Please spread the word to others in your network. The Future-Fit Business Benchmark is a free, open-source resource so you can start using whatever is helpful in your efforts as a sustainability champion. Go for it!